Pediatric Otolaryngology - a branch of medicine that studies the diagnosis and treatment of respiratory diseases, ear, nose and throat, as well as anatomically border areas. in children and adolescents. Adenoids - indications for adenoidectomy in a child is a serious difficulty in nasal breathing, snoring, recurrent otitis. You can not delete nasopharyngeal tonsil prophylactically: it plays a protective role by participating in the work of the immune system. Tonsils - Modern methods of tonsillectomy can significantly reduce the pain and blood loss and shorten the period of recovery after tonsillectomy. Angina - Recurrent angina affects the entire body, greatly increasing the risk of rheumatic fever and other serious complications. 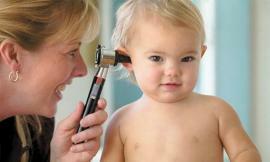 Hearing problems - Methods of correction of hearing acuity in a child depends on the cause, causing its decline. 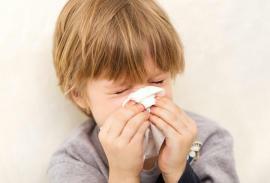 Runny nose - the reason for the development of the common cold in a child can be many - from hypothermia and viral infection to an allergic reaction. Otitis -For the getting rid of problem it is necessary to conduct a thorough examination and to establish the causes of the inflammation. Sinusitis can be suspected in a child, if in addition to shortness of breath and a runny nose with green secretions have complaints of pain on the sides of the nose, swelling of the area. If a deviated septum in the child there is a violation of nasal breathing and chronic infection in the nasal cavity, the situation is need to correct surgically. Signs of Allergic rhinitis - Long violation of nasal breathing, nasal congestion, sneezing and the deterioration of smell in children. Among the complications of ENT diseases can be isolated lesions of the internal organs - kidneys, joints, heart, diseases of the gastrointestinal tract. In the presence of chronic foci of infection in the body's is undermined an immune system, as well as is slowing psychosomatic development. For this reason, it is important to pay close attention to the correct diagnosis and competent treatment. The basic rule for every parent is that when the first symptoms of the disease, it is necessary to consult a doctor, otolaryngologist, for help. With a history of asthma, rheumatism, frequent acute respiratory infections, pneumonia, bronchitis, kidney disease. Impedancemetry and Tone audiometry - these modern methods of research of the hearing enable objectively qualitatively and quantitatively identify his hidden pathology and provide the necessary assistance. Endoscopic examination - allows carry out a detailed examination of the nasal cavity, sinuses and eustachian tubes. All this is very important for accurate diagnosis and at the decision of surgical treatment. Timely diagnosis will help to prescribe the effective treatment and to protect the child from the serious complications of ENT diseases. During the consultation otolaryngologist examines the child: nasopharynx and ears with the help of special tools, the analysis of the disease, installation of the diagnosis and appoints necessary treatment, functional and laboratory studies (immunological blood tests, microbiological study of the flora of the nose and oropharynx, X-ray of the paranasal sinuses, cytological examination of mucous and other), if necessary - the medical procedures (flushing, infusion of drugs, purging of an auditory tubes).